Bright and cheerful classrooms contain a full range of play and learning opportunities. Art and craft projects are part of the work period along with puzzles, blocks, table toys and games. Books and music are an integral part of the curriculum, as well as enrichment programs. A twice-weekly music program is offered along with a nutritious snack each day. Physical coordination and development are aided by active play on our well-equipped new outdoor playground and in our rainy day “Big Room” during cold or inclement weather. Each child develops at his/her own pace in small classes that allow for individual attention. Age cut off for all classes is October 1st. 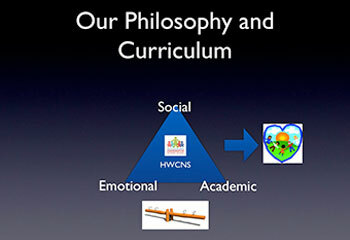 AT HWCNS, our curriculum is a balance of social, emotional and academic learning. The focus of this balance of learning changes as the children progress through our 2, 3 and 4 year-old Programs, as you will see below. We also follow the Handwriting Without Tears Program (HWT) to support the academic elements and we use different age-appropriate, hands-on, tools from this program to help the children master handwriting in a fun and structured way. In the 2's class, children are learning important social skills, such as separating from a parent or caregiver for the first time and sharing toys with a friend. Emotional skills, such as walking in line and sitting in circle time are also being developed. We introduce introductory pre-school academics, such as letter, number, shape and color recognition and simple counting. The Handwriting Without Tears materials support children with these skills and help them to develop the fine motor skills they will need to write in the future. As children progress to the 3's class, the emphasis on the social skills increases. 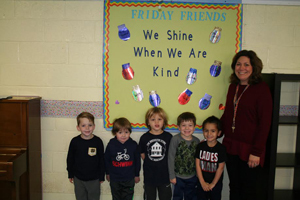 By this stage, children are interacting and talking much more with their peers and we are able to focus more on social skills, such as kindness and respect during their daily activities. The academic focus increases in the 3's also, with children developing their pencil grip and gaining more confidence in letter and number recognition. The HWT Program also supports the academic learning in the 3's class. The HWT Wooden Pieces are introduced to the children and they learn the concepts of ‘Big Line, Little Line, Big Curve and Little Curve', which will help them to recognize letter formation. By the time the children reach the 4's class, whereas social and emotional skills are still very important (such as taking turns to speak in circle time), the focus on the academics increases in the 4's class, as we prepare the children for Kindergarten the following year. We also increase the use of the Handwriting Without Tears Pre-School Writing materials, such as the Stamp and See Screen, HWT Chalk Boards and the HWT pre-school workbook. This special program is designed for children aged 18-24 months. With nursery school just around the corner, the Mommy & Me program allows toddlers to experience a mini preschool day in a loving and nurturing environment. The program follows an early childhood education curriculum. Together, you and your child will enjoy developmentally appropriate play and learning experiences during music, circle time, play time and snack time. 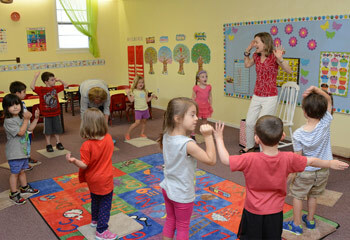 The class includes stories, music and movement activities, art projects and more. The program runs for two 12 week semesters in the fall and spring, meeting once a week for a one hour and fifteen minute session. This program focuses on your child's introduction to school. Over the course of the year children will learn listening skills, following directions and social interaction through the sharing of ideas and experiences. This program focuses on your child's continued social and academic development. Over the course of the year children will learn to become more independent and will work on reading readiness skills, early mathematics, sharing and resolving differences with peers. The program and activities are flexible and varied to encourage each child's individuality through dramatic play, art, music, discussion, stories and games. This program focuses on getting your child ready for Kindergarten. 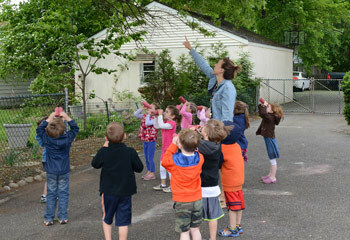 Children learn awareness of self as an individual, a member of a family and a preschool group, along with exploration of their environment: neighborhood, community, weather and seasons. They develop speaking skills through story telling and show and tell. This program also continues to build upon the foundations laid in previous years, such as letter recognition, letter sounds and letter writing. Our program also includes challenging math activities, discovery-based science experiments and thought provoking language arts. Letters, letter sounds and rhyming games, alphabet hunts, upper and lower case matching and writing activities is the focus on Monday and Wednesday afternoons during the Reading and Writing Readiness Enrichment. Children are having fun without even knowing they are learning the very beginning basics of reading. Children use their little fingers to create letters using a variety of methods, including our Handwriting Without Tears tools, shaving cream, play dough and wiki sticks, just to name a few. All lessons are hands on. There are different activities each week to enhance letter recognition and writing skills. Children learn all about the five senses, numbers and shapes, patterns, density, static electricity and chemical reactions on this fun afternoon during the Math and Science Enrichment. We perform experiments throughout the year and during our cooking unit we create delicious snacks and smoothies by measuring, pouring, counting, mixing and then eating our creations at the end. During Yoga and Art Enrichment, children participate in fun yoga games and activities and learn and practice strength, coordination and relaxation poses, all of which are based on a different literature or other theme each week. Examples of themes include Fall, Winter, Valentine's Day, Dr Seuss and Spring. Following the yoga session, children develop their creativity and imagination further with a fun art project, such as creating Dr Seuss Truffula Trees or making Mindfulness Jars following reading from the book, “Peaceful Piggy Meditates”. This program is offered on Fridays to our 3 and 4 year-olds. Spanish Enrichment at HWCNS is a wonderful opportunity for your child to be introduced to the Spanish language through activities, crafts, songs and games. They will enjoy learning how to identify different animals and colors, express their feelings, describe their clothes and practice their new vocabulary during show and tell and shared snack and mealtime. The class will also take a whimsical trip around the Spanish-speaking world learning about different customs, receiving stamps on their “pasaportes” and collecting souvenirs from their adventures. 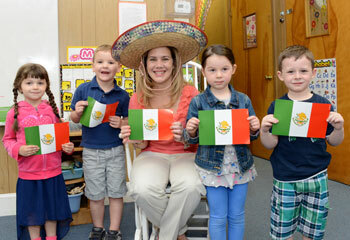 This high energy and fun way to learn Spanish is sure to capture your child's imagination.